You may remember that I was super excited to read Forbidden (see my review), the first book in the series. While I looked for an advance copy of Mortal, I was okay with waiting to read it. It took several months to find a copy at a library that would let me check it out (my system didn't have a copy). And I have to say, I had a very hard time getting into the story. I was 200 pages in and I still wasn't hooked. I just couldn't see a point to the story. There was a lot of stuff going on, but it didn't seem like anything was happening. Mortal takes place 9 years after the end of Forbidden. It is weeks away from the plan that was put into motion at the end of Forbidden. Rom, the boy Jonathan, and the other Keepers have banned together with the Nomads who have always lived outside of Order. You might wonder why I kept reading when I wasn't hooked by the halfway point. I've read enough of Dekker's books to know that there is always a payoff in the end. Whether it is the end of the book I'm currently reading or story arc a book or two later. 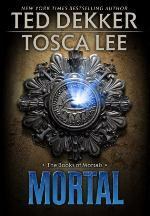 By the end of Mortal I was glad to have mustered through it and I'm looking forward to the third book, which is due out next year. As always, the story made me examine my own perspective on my beliefs. I wonder how non-believers view Dekker's books. As a Christ-follower, I can't help but see the parallels to the Gospel. Mortal even gave me a new understanding as we looked at the Crucifixion on Sunday. There are several instances reminiscent of the Circle series - Jonathan as the savior figure, nomadic tribe, the Gathering. I imagine Dekker's walls to be littered with post-it notes to keep the intricate web he has woven through and amongst his stories straight. If you are looking for a story that makes you think, one that doesn't give you all the pieces, then you should try Mortal, but you will need to read Forbidden first. I, like you, had a very difficult time getting into this story, despite having read enough of Dekker's books to have a sense of what might be going on. Unfortunately, this book just didn't do anything special for me and seemed like a retread of his Circle series to the point of being largely unimaginative. Also, I was shocked by how poorly edited this novel was. Yikes!